I drive about 13,000 miles a year. Have one baby and another on the way with plans for more, so needing a 3rd row. Wanting to keep this car for a long time. I do go to my family ranch often, so I need it to be 4 wheel drive. 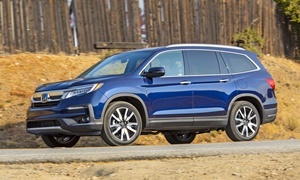 The 2009-2015 Honda Pilot is a good option. 4WD, rugged, spacious interior, doesn't look like a mom-mobile. It isn't uncomfortable like the body-on-frame SUVs are. It can seat up to 8. If you have the guts to drive a minivan, the 2011-2017 Toyota Sienna AWD is worth a look. It'll be more comfortable and practical than the Pilot. I don't know howtreacherous your ranch is. I think it would handle some mud, but not up a steep hill. It's the only AWD minivan. More practical than an SUV, except with reduced towing. 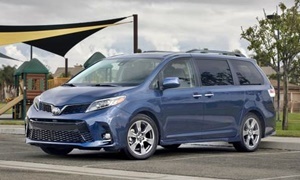 Many unibody (car-based platform) SUVs don't have any better off-road capability than the Sienna. It seats 7 with AWD, 8 for FWD depending on trim. I wouldn't go with the Chevy Traverse, Suburban, Tahoe, GMC Acadia, or Yukon because you won't have the same reliability and with the Suburbans/Yukons, you won't have the same comfort. LectroFuel offers great advice asusual. In general I am not a GM fan. However, in regards to longevity, the Suburban and it twins are recognized as several of the rated as one of several of GM "trucks" that made the Top 10 list of vehicles on the road after 300,000 miles.Soyou may wanttoadd that to your list. The reason I said that was because one of my family members owned a early 2000s Suburban and they had a lot of problems with it. The car would randomly stall when turning the steering wheel. This somehow made the steering wheel lock up, so it was a death trap. You could only use your brakes if you were driving head on into something. Around the start of that the transmission failed, so they were done with Chevy. It didn't have many miles either and was only 8 years old, probably a lemon. They actually ended up buying a 2010 Honda Pilot Touring which has been reliable to them since. The Suburbans are probably cheap to fix but you'll need to fix them more often. Beware the 2007-2010 Suburbans had many engine failures because of oil cosumption with the 2007 making up the majority of these reports. i second the honda pilot. we have a 2006 awd with 198,000 on it with no problems but regular maintenance.